It’s Only a Play is funny. Extremely funny. And it ought to be. Some of the funniest actors in the American firmament get together and do comedy routines one after another, get a lot of laughs, and call it a play. But no. The actors are polished professionals with heart, and if the audience had a lick of sense the comedy might not be as painfully long as it is, but the starstruck audience applauds when the curtain opens, when the wonderful but unknown Micah Stock enters and they’ve no idea who he is. 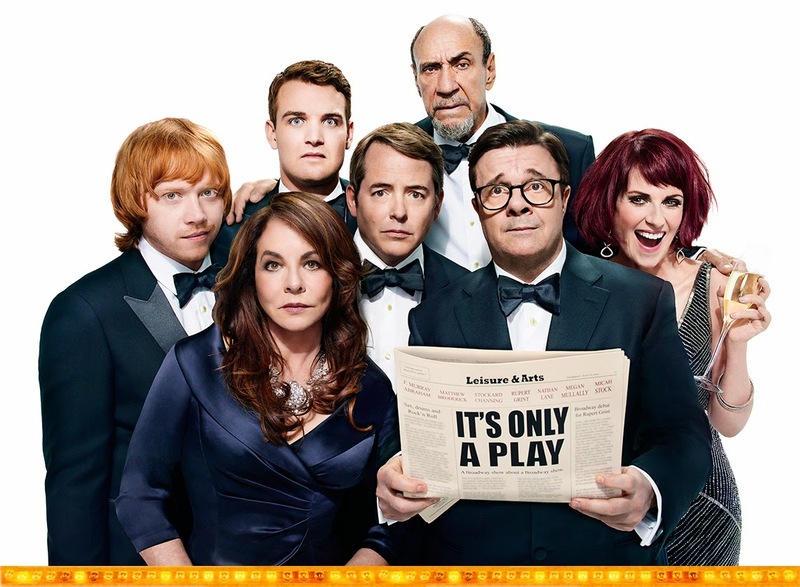 They applaud some more when Nathan Lane enters, and when Megan Mullally enters, when Isabel Keating enters (stepping in for Stockard Channing), when Rupert Grint enters, when F. Murray Abraham enters, and when Matthew Broderick enters. The annoying audience stops the action every time they do that, and when you blow the timing in comedy, you blow the whole routine. I swear, if they just stopped treating the theatre like a comedy club or a cabaret, It’s Only a Play might come in at two hours instead of two and a half. But for all my grousing about it not being a play, were it not for the multi-star contracts doubtless in place, It’s Only A Play would probably run forever. The audience loves it. The cast is superb and Jack O’Brien’s direction sharp and brisk and right on the mark. As the wunderkind British director of the play that thankfully does not appear within the play, Rupert Grint enters dressed as a Carnaby Street peacock with a crested carrot top. The character sometimes crawls under a large black net — shades of Harry Potter’s invisibility cloak — in order to disappear, and at one point in the second act, that worked so well that I forgot he was there, thinking he’d left the stage. Not a good sign. But Mr. Grint — as well as Isabel Keating, understudy to Ms. Channing — is not at the level of Ms. Mullally or Messrs. Abraham, Broderick, Lane, and even young Mr. Stock. Matthew Broderick did himself charmingly, Megan Mullally was pitch perfectly annoying and lovable and sweet and dizzy. F. Murray Abraham played opposite to his usual villainy and was very funny as a foppish, foolish, envious theatre critic. Nathan Lane takes a character with a tired premise and rises to the heights of great comedic acting. Essentially the playwright wrote a formulaic comedy with stock characters: a typical playwright from another time, a typical TV actor who left the theatre ten years before, a typical drug-addled movie star exiled from Hollywood and trying to make a comeback on Broadway, an obnoxious, foul-mouthed, British wunderkind director, a star-struck actor looking for his big break collecting coats at a Broadway opening party. All in all, it’s rather like, hey my dad has a barn, let’s put on a show in black tie and tails. After the first quarter hour, I started to suffer from snide name-dropping overload and wondered how often Terence McNally will have to rewrite to keep the names topical. This was all nastily funny, but made me think more of a weekly comedy show on television than a star-studded play on Broadway. When it’s said that a play must have a beginning, a middle and an end, that doesn’t mean it begins at 8 o’clock, ends at 10:30 and has a break for booze and bathroom visits somewhere in the middle. No, it’s the story that needs to begin and progress to a conflict thence to a point of crisis around the middle then fall apart or resolve itself by the end of the story. It is certainly the case that with some plays it’s hard to immediately recognize the ending, partly because we’re unaccustomed to hearing it ourselves after years of watching films that go black, credits rolling, music swelling and sometimes even the words “The End.” Onstage it’s not necessarily as blatant as these slaps in the face, especially Irish plays that may end in irresolute resolutions. But within a moment of that uncertainty, it’s an ending. 10:30 p.m. is not an end. At any rate, the dog was genius, the actors perfect and hilarious, the direction brisk, the play slowed down primarily by the annoying audience …although the last scene does go on a bit longer than it ought. The scenic design did not rate applause at the opening, but was perfectly serviceable. Again, the actors and direction are terrific, but Mr. McNally, funny as all his lines are, was a tad disappointing, because It’s Only a Play is not. ~ Molly Matera, signing off to re-read Aristotle’s Poetics.